In 2014 I experimented with overhauling my diet in the hope that it might have a positive effect on my diet. It did. And so much more besides. You can read about it here and listen to my experiences on the Paleo Runner podcast here. Inspired by the aforementioned podcast, as well listening to Tom Williams experiences on Marathontalk, I have decided to see if running less will make me a better runner. It sounds counter-intuitive but after reading several blogs and listening to dozens of podcasts, it is clear to me that there are people pulling off some epic feats of endurance on very little mileage. This includes some impressive marathon times and going really long at ultramarathon events. I should be clear that I won't just be substituting running with more time on the sofa. Rather, I want to see if combining running with other forms of cross-training will have a positive effect on my race times. So, as part of Jantastic I have set my run target to just 4 runs per week, plus 1 swim session per week. I have also been doing 1 - 2 crossfit sessions per week (but these are not counted as part of Jantastic) and plan to get out on my bike regularly once the weather improves. As any experienced runner will know, running is very good at identifying weaknesses in your body and whilst I have been fairly injury-free over the 7 years I have been running, I am aware of the need to remain strong in order to stay injury free. I am also toying with the idea of doing a triathlon later in the year, so hope this more balanced approach will help me in preparing for this. I have some 10k's and half marathons planned for March - April time, so check back later in the year to see if this approach is having a positive effect on my times. I am also interested to hear about your experiences and if running less, combined with cross-training has had a positive effect on your running. If so, which exercises and sports do you find more beneficial? Last Sunday I ran in the 2014 Chester Marathon. Having failed to go sub 3:30 at Milton Keynes (weather and lack of training) and Berlin (packed field in the early part of the race) in 2013, I was determined to hit my goal at the third time of asking. I had heard good things about Chester and it did not disappoint. The organisation was excellent, there was plenty of space at the start / finish area of Chester Racecourse. The course was not flat but not hilly by any means. There was plenty of support as you passed through the various villages on the route and the crowds in the last couple of miles provided us with a real boost. 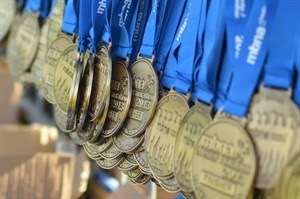 I can see why it has been voted the UK's favourite marathon by Runners World readers. The conditions on the day were nigh on perfect and I was feeling confident at the start. My training for Berlin last year had gone well and I believe that if it were not for the aforementioned crowded field, I would have gone under 3:30 there. I chose to go with the same 3:30 marathon training plan which is created by an American trainer by the name of Jeff Gaudette and is free on the Runkeeper app. My training on the whole went well. I had a much better base of fitness than prior to my training for Berlin and save for missing the odd session (largely down to holidays), it went without a hitch. Due to the High Peak 40, which was 2 weeks before Chester, my last long run (22 miles @ marathon pace) was 4 weeks before race day. Ideally this session would have been run 3 weeks out but otherwise I don't think I would have changed much. The main difference between my training and racing at Berlin and my training and racing at Chester was my nutrition. I had felt for a long time that nutrition was one of my weaker areas and somewhere I could target for performance gains. Back in April, I started eating a 'paleo style' diet. My motivation for this was that I had heard about people running relatively fast marathon times and doing so without the need for traditional fuel, both prior to and during the race. This was something that appealed to me and so I set about a radical overhaul to my diet. More on which to can read about here. I believe that the changes I made to my diet back in April and the adaptations that have occurred within my body over the last 6 months are the key difference in me achieving a sub 3:30 marathon at the third time of asking. On my way to Chester, I have lost over a stone in weight and am keeping it off, despite having relaxed my diet a bit recently, I scored big PB's for the 5k and 10k on the way to a 6 minute PB in the marathon at Chester. I am also able to run for 3+ hours without the need for energy gels/drinks etc. At the High Peak 40 I ran for 8 hours and burned over 5000 calories. Yet I only had a smoothie for breakfast and consumed less than 600 calories on the run. At Chester, I ran in a fasted state, having only had a coffee and cream for breakfast. On the run, I only consumed water until mile 25. Having run up the final hill (and admittedly feeling pretty spent), I grabbed a gel from a marshal. I am sure the benefit of that gel was purely psychological as I doubt it would have been digested by the time I finished the race. When I began this journey back in April I had hit a plateau and I knew I had to change something in order to kick on. I had no idea whether 'going paleo' was going to work for me, let alone effect my performance in a positive way. 6 months down the line, I am really pleased to be able to say that it has done both. Day-to-day I feel much better, with more energy and no sugar crashes. My performances this year speak for themselves. I have arguably done slightly less training, yet because I have been able to shed a bit of weight, I have been quicker. Plus it has saved me a fortune in pre-race, race and post-race nutrition! I would love to hear from others that have gone through similar changes to their diet and am more than happy to answer any questions from anyone who is considering switching to a paleo or low carb / high fat diet. I am now a fat burning beast! Back in April of this year, I made a change to my diet and started eating a paleo / or primal style diet. If you missed my original post about what that entails, you can read it here. Part of my motivation for overhauling my diet was because I believed it would improve my running performance and allow me to use primarily stored body fat, rather than sugar as fuel. I wrote about my quest to become a fat burning beast back in May. You can read the post here. I have to admit, despite what I had read and heard about going paleo and what it might be able to do for my running, I had my doubts. Having been a sugar burner all my life, I didn't see how it would be possible to run for 3 hours plus, in a fasted state and not chugging down loads of gels and energy drinks before, during and after the run. But on Sunday, that's exactly what I did. As part of my training for the Chester Marathon, I ran 22 miles at an average of 7:59 minute miles. That's just under 3 hours of running. What did I fuel myself on? Well, I got up, had a coffee with cream and that's it. On the run, I consumed 750ml of water and nothing else. The statto's can see my Strava activity here. I'm not going to say it was easy. After all, I was running at PB pace. But I felt stronger as the run went on. I never had any sugar crashes or came close to hitting the wall. Not only that but I recovered really quickly after the run. I didn't get back and feel like I had to eat all of the food in the house and was still able to commit to the list of chores Mrs M had lined up for me! Without even training for speed, I have PB'd in the 5k and 10k since going paleo. Losing a stone in weight will do that for you. Plus, I am saving a fortune in 'nutritional products' as I am not having to buy gels, energy drinks and recovery shakes. Obviously the big test will be Chester. Not forgetting the small matter of the High Peak 40 ultra marathon a few weeks beforehand but after eating paleo for 5 months, I do now feel like I can call myself a fat burning beast! 21 miles, 3 hours 50 mins, 2,439 foot of ascent and 2,726 calories burned. Fuelled by a couple of handfuls of nuts and seeds and 4 dates. On Sunday I ran the second half of the High Peak 40 route with Mike, Al and David. The plan was to have some fun in the Peak District and recce the second half of the route. Having switched to eating paleo in April, it was also going to be my longest run on this diet and the first real test of how this change of nutrition would affect me on a longer run. Before I get into that though, I want to thank Mike for organising the run and navigating the route, Al for giving me a lift and David for picking up the navigation when Mikes recollection of the route let him down! As always it was great to run with them and a beautiful day in the Peak District. Overall, I have been sticking quite closely to the paleo style of eating. I relaxed this whilst I was on holiday, allowing myself more alcohol, desserts and ice cream! That little diversion aside, I am really enjoying what I am eating and don't really see myself changing from this lifestyle. When I woke on Sunday, I didn't feel hungry but conscious of the day ahead, I thought I better eat something. My breakfast consisted of home made nut muesli with a couple of blueberries and some almond milk. I also had a Nespresso coffee with full fat cream. This would have been about 7:45am. We started running at about 11am and my plan was to just eat when I became hungry. I didn't actually need to eat anything until 2 hours 20 mins into the run, even then I wasn't that hungry or facing any sort of crash. I just had a handful of nuts and seeds. Plenty of natural obstacles to negotiate! Over the next hour and a half, I consumed another couple of handfuls of nuts and ate 4 dates. At the end of the race, I drank a home made smoothie consisting of frozen berries, almond milk, Greek yoghurt, peanut butter and honey, and ate a Trek bar. This would have been about 3pm. We travelled home and I didn't eat anything until about 7:30pm when I had a normal sized meal of home made beef burgers, basmati rice and a salad. About an hour later I had a coffee with cream. Yesterday was an amazing day of running with great people in a beautiful setting but it also served as a really good experiment and test of how my long run / race nutrition is adapting to the paleo diet. I have to say, I was really pleased with how it went. I never felt like I was going to bonk and whilst I wouldn't say that I had endless energy, I was really pleased with how my body responded both during and after the race. I would usually want to eat all of the food in the house on returning from a 20 mile run! I am hoping that as a I train for Chester, I will be able to encourage my body to become more fat adapted. Watch this space! Being a seasoned runner I've come to take for granted how important it is to choose a good sock for running. I was reminded of this recently when my sister took up running. She is completely new to the sport and has been running a 2 mile loop from her house. She dropped me a line the other day complaining of blisters. I said that I've run 50k's and not suffered with blisters and told her to invest in some good quality running socks. A good running sock is important because it is the only thing that puts you in touch with your running shoe and, ultimately, the ground. If you are running a lot of miles (or even if you are not, in the case of my sister), it is vital that you find a sock that fits well, offers you some extra cushioning and vitally, assists with wicking sweat away from your feet. I was recently lucky enough to be sent a couple of pairs of running socks by the guys at the Sock Mine. You can check them out here. They sent me one pair of their cool runner socks and one pair of their cool runner anklet. I really like the fit of these socks and they provide support and extra cushioning where you need it (see picture below). What has impressed me most though about the socks from Sock Mine is their quality. Some running socks will lose their shape or their cushioning after a few wash / wear cycles but these feel as good after several runs and washes as they did when they were brand new. So, if you are new to running, invest in some good quality running socks. For a small investment you will find your runs will become far more comfortable. After all, as runners, it is important we look after our feet. We may be asking them to run a lot of miles! Happy feet = happy running! Prior to going paleo just over 2 months ago, if had you asked me if I suffered from any sort of GI distress or digestive problems, I would have said no. I was always regular, maybe a little too regular sometimes. Certainly 6 movements a day was not unheard of! Far from being an issue, I saw this as a sign of a healthy constitution. After going paleo, I noticed that my movements were less frequent but other than that I didn't really give it too much thought. Last night we celebrated my mother-in-law's 68th birthday. Naturally, we had some champagne and a few glasses of red wine. The meal was paleo (homemade lamb tagine) save for 2 spoonful's of couscous but I did follow it up with a slice of pecan roulade and a slice of tarte aux citron (both of which were shop bought). Fast forward to this morning and did I feel rough?! As I mentioned above, I had a couple of drinks but nothing close to making me feel that bad. My stomach was lurching and I had to take an emergency pit stop halfway through my run! Then I realised, prior to going paleo, I used to feel like this most mornings. I was a big proponent of Tony Audenshaw's "2 poo strategy" (listeners to Marathon Talk will know what I mean). In fact, mine was often a 3 poo strategy. I appreciate that this is not the most pleasant of topics to write about (or indeed have to read!) but I wanted to highlight the fact that in my pre-paleo days, I felt that my GI health was good and perfectly normal. It is only now that I have made these nutritional changes that I am able to look back and see that what I experienced this morning was anything but normal! A quick update on my quest to become a fat burning beast! So, I have been eating a paleo / primal diet for just over 2 months now. As I mentioned in my previous post, I have found the transition to a low carb diet really easy and I am someone who has always eaten a lot of carbs and sugary snacks. Mark Sisson says that a good way to test if you have become a fat burner (also known as fat adapted), it whether you can skip a meal without feeling feint, ratty or any other symptoms you would usually associate with missing a meal. Previously, I would have struggled going even a few hours without a meal or a snack and my wife could always tell when I was heading for a sugar low because I would become really short and snappy! I am now at a point where I can comfortably go for 6 hours without feeling the need to eat. Often, that window will have included some exercise. When I adopted this way of living I felt that the challenge was always going to come when I wanted to teach my body to burn fat (rather than carbs / sugar) during my long runs. I feel I am well on my way to becoming fat adapted and I have been able to run for over an hour and a half without any fuel (and even in a fasted state). This is running at my sub-aerobic threshold of less than 135 BPM (or 75% of my max heat rate). The trouble is, currently this equates to roughly 9:30 minute miles. My target mile pace for Chester Marathon is 8:00 minutes per mile. As you can see, I have some work to do in order to be at 75% of my max HR whilst running at 8:00 minute pace! Having run an easy 10k on Saturday, I tried for a fasted 9 mile effort at marathon pace on Sunday. I don't mind admitting that I found this harder than expected and simply wasn't able to hold the pace in the final few miles. It is all well and good being able to go for 6 hours without needing to eat but I need to ensure that I have enough fuel for my runs, so this was a good lesson in this regard. I have faith in my training plan (which starts on 17th June). I used the same plan for Berlin last year and I remember how my fitness improved on those longer, marathon paced efforts. Of course, I was a sugar burner last year, so it will be interesting to see how my body copes with those longer training runs this time around. Watch this space!